Although not actually bugs, I would like to cover pet snails on this website too. They are common and fun pets similar in care to pet insects. The most common species of giant snail to keep are part of the Achatina genus, like Achatina fulica and Achatina achatina. Their common name is Giant African Snail. The pages on this website about keeping landsnails as pets only cover Achatina Giant African Snails. The body of a landsnail is without any bones or though structures, it gets its protection from its shell. It can retract its whole body inside of its shell! All snails have a shell, because a snail without a shell is called a slug. The body of a snail is soft and flexible, it is composed mainly of water. It can be divided in to three segments; the head, the foot and the visceral sac. On the head the sensory organs are located, like the eye stalks. The foot is the part of the body you usually see. The snails moves itself with its foot by making a wave-like motion with the muscles that are in there. The slime it secretes makes sure moving goes smooth! The visceral sac is located inside the shell and has all the organs of the snail. 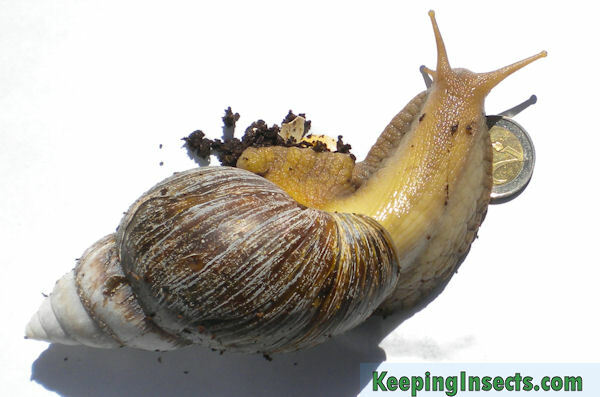 This is an adult Giant African Snail – Achatina fulica. Even snails have all the senses humans have! Snails have one pair of eyes located on stalks, these eyes cannot focus well but they are very sensitive to light. The other pair of stalks, the smaller ones located under the larger ones, are equipped with sensors for smell and touch. Snails can retract their tentacles completly, using ‘blood’ pressure and a muscle. The mouth of a snail is located under its body, and functions like a rasp. It is called a radula. When the snail is moving over food, it will rasp pieces off the food and eat it. Giant African Snails need an enclosure that is at least 3 times the lenght of the snail in width and in depth. The height should be enough to have the snail be able to walk without touching the lid. The enclosure should be ventilated but they do not need a big ventilated cover or something like that. They like their environment humid. On the bottom of the enclosure you need to put soil. You can get some soil from the garden or you can use potting soil. Keep this soil moist, but not too wet (you should not see mud!). Sometimes the food will add a lot of water to the enclosure. If the soil gets too wet you should increase the ventilation of the tank. This is the enclosure of some young Giant African Snails. African landsnails need a temperature of 19 to 26 °C. They can also be kept cooler but this will seriously delay growth and reproduction and can sometimes be bad for their health. In the night it is okay to let the temperatures drop. This species of landsnail eats all kinds of raw vegetables and fruits; carrot, potato, leek, cellery, pumpkin, apple, tomato, cucumber, aubergine, mellon and many more. You can just place the foods on top of the soil in the enclosure of the snails. They will eat it very soon! Do not feed them more than they can eat in about two days, otherwise the food will go bad and smell. Giant African Snails need calcium to form their shell. If you do not feed them extra calcium they will try to eat each others shell and they will develop very brittle shells. You can feed your snails calcium by giving them a sepia. This is the shell of a cuttlefish that is sold as calcium for birds. The snails will eat from this according to their individual needs. Be prepared to feed them a lot of this! You can also buy powdered calcium and put this over their fruit and vegetables. 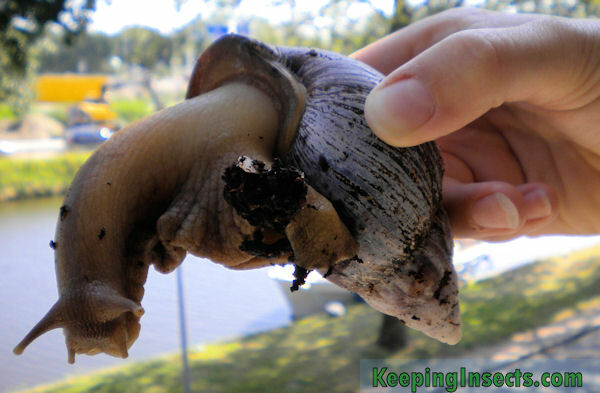 It is very easy to breed Giant African Snails. Once they are adult they will breed automatically! These snails are hermaphrodites. This means they are both male and female! You do need two snails to mate and fertilized each other. Both will produce eggs. The eggs are buried in the soil. They are quite big and yellow greenish in color. If you leave them in the soil they will hatch without any problems. The amount of eggs a snail produces is enormous, around the hundreds per month. You cannot take care of all these little baby snails. Therefore it is best if you make sure that not all eggs hatch, by drying them out or freezing them. 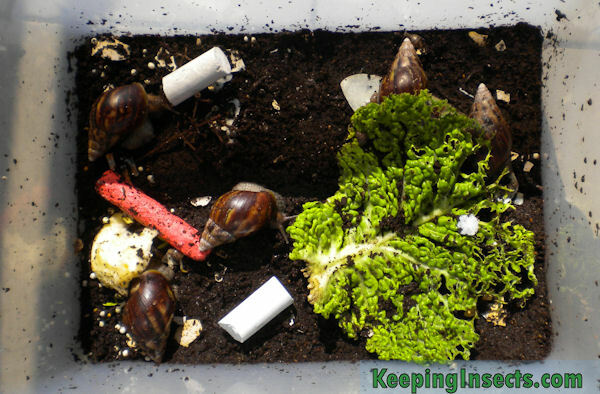 It may seem harsh, but not being able to take care of young snails is much worse. You absolutely can not release these snails into nature. These snails are considered invasive species and are even illegal to keep in some countries because they are becoming pests. Releasing these snails into nature will cause a lot of damage to nature!